Who doesn’t love some comfort food once and a while? 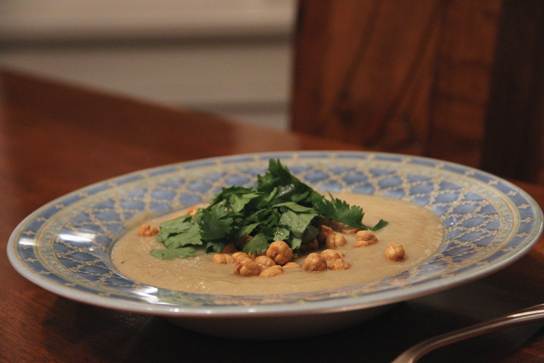 This savory, creamy, and flavorful soup totally hits the spot. And, for you Indian food lovers out there, we’ve got you covered! Mmm. Easy and under 30 minutes, this recipe is the perfect compliment to any weeknight meal. Wash uncooked cauliflower, remove any leaves, and cut in half through the axis (or poles). Remove the woody core. Cut into florets. Peel garlic and roughly chop. Add coconut oil to a large pot over medium heat. Add the onions and cook until they are soft and translucent, about five minutes. Add coriander, cumin,garlic and ginger, stir gently for just about 30 seconds. Add the cayenne and turmeric, water or vegetable stock. Serve. An optional cilantro garnish is a nice finishing touch. If you want to make this a main-dish soup, I would suggest adding some protein. For the potatoes, you could substitute two 16-ounce cans of chickpeas or white kidney beans.